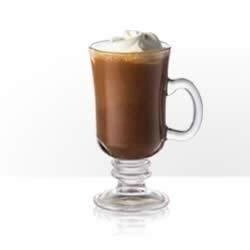 "This is the classic Irish Coffee recipe, made with the classic, Bushmills® blended Irish whiskey." Pour coffee into a warmed Irish coffee glass mug. Add sugar to taste and stir to dissolve. Pour in Bushmills(R) Original Irish Whiskey; top with slightly whipped cream, poured gently onto the drink over the back of a spoon. For more great recipes, visit thebar.com. Always open. Always serving responsibly. A warming cup of cheer for a cold winter's night. Good balance of alcohol and sweet coffee. Mmmmmmm don't omit the whipped cream, it makes it! This is the original Irish Coffee from the early day's of flying into the Sharon Ireland Airport, were it orginated. Not before flying in airplane, did this drink exist.